AUD has been under pressure due to Gross Domestic Production data and AUDUSD has reached its lowest spot since December. The support rests in 0.76690 with resistance at 0.77250 which both lines are below the weekly pivot point at 0.77780. The EMA of 10 is moving with bearish bias in the descendant channel and it is located below the EMA of 100 and the EMA of 200. The RSI is moving in oversold area, the MACD indicator is in negative territory and the Stochastic is moving in low ranges. The ADX is showing weak buy signal. The price is below the Ichimoku Cloud and above the Chinkou Span. The Tenkan-sen is showing a downward trend while the Kijun-sen is showing a horizontal trend. 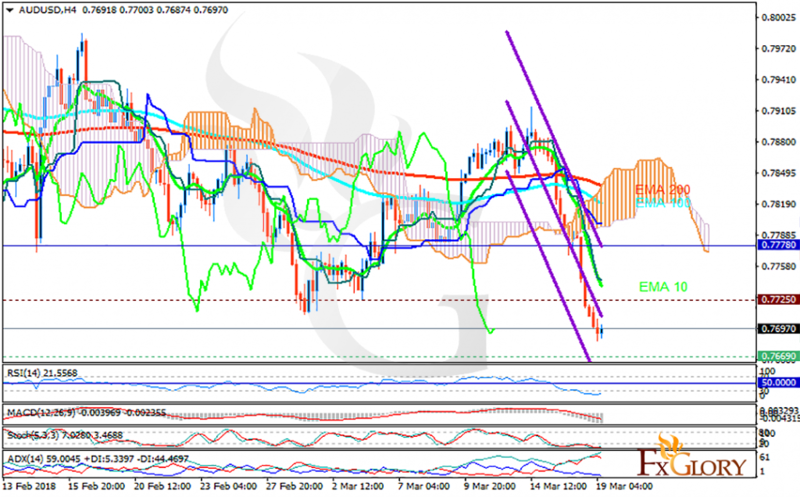 AUDUSD will continue to be bearish targeting 0.7635.